DisneyDreams.Net >> The Complete Resource for "The World"
Magic Kingdom: New Fantasyland adds to the fun for Disney Guests. Downtown Disney: You’re in luck this St. Patrick’s Day with even more fun at Pleasure Island. Epcot:Feel the flower power at a groovy concert series. Resort Stays: Stay with Disney Royal Friends at new Story Book Rooms. Disney's Grand Floridian Resort & Spa (2011) 3D, Disney's Polynesian Resort (2011) 3D, Epcot New Years Eve 2011 Fireworks 1080P 3D and Disney's Boardwalk Resort and Villas (Xmas 2011) 3D. Kidani Village at Disney's Animal Kingdom Lodge, New Fantasyland Construction Video Sept 2011, Mickey's Not-So-Scary Halloween Party 2011, Main Street Electrical Parade 2011, Expedition Everest , Big Thunder Mountain Railroad, Boo To You Parade 2011 and Happy HalloWishes 2011. Magic Kingdom: Calling all sorcerers for new interactive experience. Disney Sports:Runners ready for marathon weekend; Speed seekers delight with new speedway offering. While at the MNSSHP, there was a storm brewing just east of the magic kingdom and the lighting can be seen in the distance. Not a big deal except when it hits the castle (or just behind it). 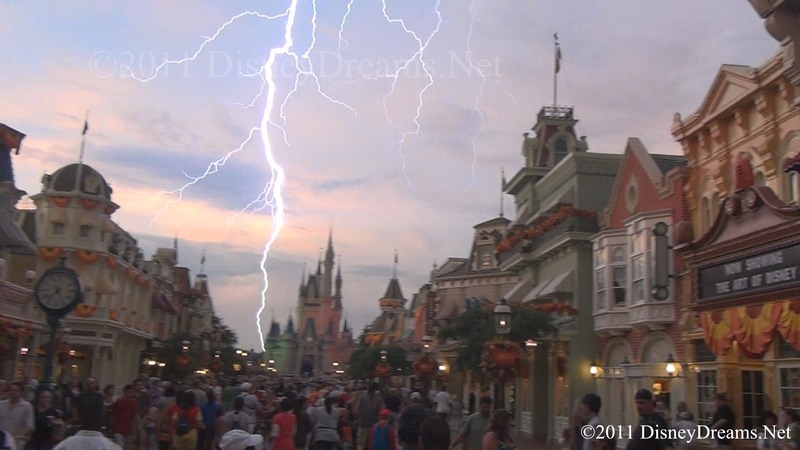 I managed to catch a one in a life time lighting bolt hitting just behind the castle is a single frame of video. I have captured the frame in HD. Magic Kingdom: Night of Joy talent musically diverse and vastly talented. Mickey’s Not-So-Scary Halloween Party returns Sept. 13. Epcot:Pre-Kickoff to Food & Wine Fest sets stage for lineup of ‘premium events. New fun cooking for 16th Food & Wine Festival. Eat to the Beat concerts serve up a heaping side dish for the ears. Resort Stays: Select Magic Your Way vacation packages include dining ‘on the Mouse’. Golden Oak will initially consist of three types of single-family homes: Village, Estate and Grand Estate Homes. Village Homes will capture the romantic look of a Mediterranean village on homesites up to one-quarter acre. Estate Homes, on approximately one-half acre homesites, will offer a variety of architectural styles including Tuscan, Spanish Revival, Venetian, Italianate, Dutch Colonial and Island Colonial. At up to three-quarters acre in size, Grand Estate Homes will include architectural styles consistent with Estate Homes and will accommodate the needs of large families. Home prices start at $1.4 million. Epcot:Foodies will be on the phone Aug. 16, 2011, to gobble up tickets for specialty events at 16th Epcot International Food & Wine Festival; Sounds Like Summer concert series heats up in July; Guests loving ‘British Revolution’. Finally completed entering the rates into the database. Glad I dont have to do that for another year! Fixed the Resort Prices page as well. Disney once again raises prices of their various room levels. We have started updating the prices and have updated the rates control to allow you to select room type. All value, all moderates, Animal Kingdom Lodge and Wilderness lodge have been updated. Disney once again raises prices of their various ticket options. A single day adult ticket with tax now tops $90.00. A single day adult ticket increased to $85.00, an increase of $3.00 (4%) and a child ticket increases $5.00 (7%) to 79.00 plus tax. Generally the are going up $3.00 per day for an adult and $5.00 per day for those 3-9. So a 5 day pass is increasing approx $15.00 per adult and $25.00 per child 3-9. Also, resort rates are increasing as well...we will have those uploaded to the database this weekeknd. Disney Studios: Star Wars Weekends return May 20-June 12, 2011; New character meet-and-greets coming in May and June. Epcot:18th Flower & Garden Festival races to checkered-flag finish with "Cars 2" stars as event celebrates Pixar's 25th anniversary. Disney guests will become the stars of a nightly spectacular when photos taken in the park during the day become larger-than-life projections on Cinderella Castle at Walt Disney World Resort or “it’s a small world” at Disneyland Resort. This groundbreaking new experience will celebrate the family vacation memories created in Disney theme parks every day. New Fresh A-Peel restaurant in Downtown Disney Marketplace. New Pollo Campero restaurant in Downtown Disney Marketplace. Newly remodeled La Cantina de San Angel restaurant in the Mexico Pavilion. Newly remodeled La Hacienda de San Angel restaurant in the Mexico Pavilion. Check out the information for pricing and other restrictions for the tour. Disney raises prices on all 5 dining plans. Disney has release the prices for the 5 Disney Dining plans for 2011. Just like the ticket prices at the beginning of the month, they are going up. Depending on the plan, it is anywhere form 4 to 10 dollars per day for an adult. Child prices are the same or just up slightly. When the plan first started, it was a bargin to use the dining plan, with these new level of prices, it is starting to be very questionable as to if the plans are worth it anymore. The quick service plan is almost the price on the standard dining plan just a few years ago. It almost seems as if the only reason to do the plan is out of convenience. The Restaurant Database has been updated for 2011. Disney removes various locations from the plan for 2011. Updating the restaurant DB, the following have been added/removed from the plan: Seashore Sweets(QS), Crockett's Tavern(QS), Cap'n Jack's Restaurant(TS), Big River Grille & Brewing Works(TS), Garden Grill Restaurant(TS), Kringla Bakeri Og Kafe(QS), Le Cellier Steakhouse(becomes signature on 3/1), Kouzzina by Cat Cora(Added), Sommerfest(Added) . Disney raises prices on all theme park admission tickets. Disney announces rate hikes for all theme park admission tickets. For those keeping count, a single day ticket rose $3.00 to $82.00 per day plas tax. With tax $87.33. While all theme park tickets rose, the child ticket rose more than adults. Even annual passes got hiked as well. New Via Napoli restaurant in Italy Pavilion. Disney announces new Art Of Animation Resort. Disney’s Art of Animation Resort will be one-of-a-kind, featuring family suites designed around four themes: The Lion King, Cars, Finding Nemo and The Little Mermaid. Scheduled to open bt the end of 2012, this new value resort sits adjacent to the pop century resort across hourglass lake. This resort will have the same pricing structure as other value resorts in this category. Read the full press release here and Video as well. Added new pics for the TREX cafe in downtown disney and added new menuitems for the Kouzzina by Cat Cora restaurant which replaced spoodles. Re-Imagined Star Tours Coming to Florida in 2011 and Major Fantasyland Expansion at Walt Disney World Scheduled for 2013. Check out twitter for micro site updates and anything random that comes to mind about disney. Book through March 31, 2012 for stays most nights April 13 to June 14, 2012. Please mention code H6C. With special AP Spring room rates, book early and save up to 35% at select Disney Resort Hotels for stays most nights 3/9/12-6/14/12 March 9th to June 14th 2012. Mention Code "RX2"